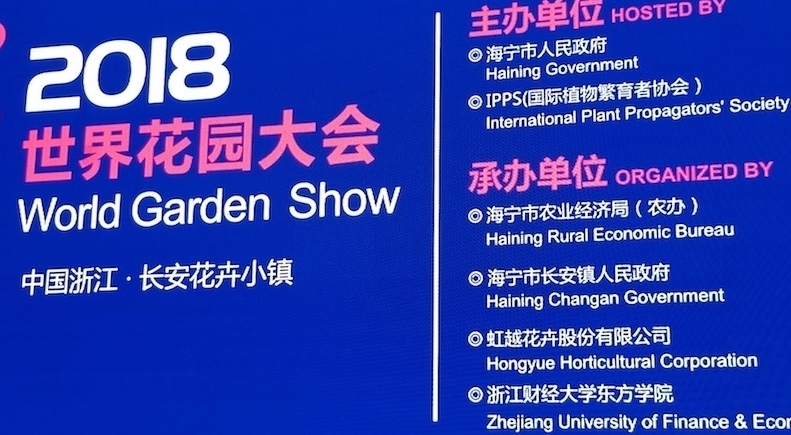 Earlier this summer a group of IPPS members had the privilege of being invited to speak at The World Garden Show held at Chang’An Flower Town, China. Chang’An Flower Town is close to the city of Hangzhou about two hours south of Shanghai. The World Garden Show is a major event set up to examine the enormous Chinese horticultural industry and look for opportunities for global cooperation. Leaders and experts from the international horticultural industry gathered to discuss, pursue, develop and establish business relationships. Over 1000 delegates from twenty countries attended the two-day conference. The event included two days of conference presentations and an extensive flower show which was open to the public. The main purpose for IPPS involvement in this event was to introduce the China nursery industry to the principles and value of IPPS membership and explain how the IPPS Australian Region was assisting in the development and launching of an IPPS China Region. The spectacular opening event included speakers from the United States, Europe, Australia and China. As IPPS International Chairman I was given the opportunity to make a presentation outlining the value of IPPS and how joining an IPPS China Region would provide a unique networking opportunity to ‘Seek and Share’ with like-minded horticultural industry people around the world. On the second day, the conference divided into sub-forums with speakers focusing on more specific industry issues, with many of a very practical nature. Topics at the sub-forums included, plant breeding, flower tourism, horticultural e-commerce, garden center development in China, plant production and propagation, landscape architecture and garden design. Dr Donna Fare - Southern Region, Di Larkman – Australia Region, Clive Larkman – Australia Region, Karen Smith – Australia Region, Dr. Garry Knox – Southern Region and Dr. Dave Creech – Southern Region. Tony and Luke Van de Stay, Jake Jackson, and Luke Warn from the Australian Region and Bill Barnes from the Eastern Region attended the conference and experienced the very generous Chinese hospitality. The attendees at the IPPS China conference were very interested in learning about how IPPS could help them become better growers and gain more horticultural knowledge from global IPPS networking. The flower show included extensive indoor and outdoor exhibitions with creative demonstration gardens as well as an extensive display of new plants and displays from local and international nurseries. The flower show was attended by many families who brought along their children to experience the beautiful gardens and plant displays. The flower show was held on the grounds of the Hongyue Horticultural Corporation nursery. The IPPS delegation was hosted by Julienne Zhu, Secretary-General, Nursery Stock Branch, China Flower Association. Some of you will have met Julienne when she has led a China nursery delegation to IPPS conferences in the Southern Region, New Zealand and Australia. She has also taken groups to IPPS member nurseries in Europe. Following the conference Julienne arranged for the IPPS delegation to visit nurseries and places of cultural and historic interest. These visits included the Hangzhou Huazhiyun Agricultural Investment Co. Ltd, the Zhejing Senhe Seed Company, the Hangzhou Floral Whisperthe Hangzhou Runtu Horticultural Science & Technolgy Co. Ltd, Xiashu Lake National Wetland Park, the Anji Bamboo Expo Park and Wuzhen in Jiaxing. Wuzhen is an ancient town established over 1000 years ago where the buildings sit on either side of canals, it is very similar to Venice. The nursery visits were impressive due to the volume, quality and in some cases the unique methods of production. The Chinese government has embarked on a program to ‘Color China’ and the nursery industry seems well positioned to assist in that goal. We also learned what ‘China Speed’ means – Projects happen very quickly! A big thank you to Julienne Zhu for helping to organize the IPPS conference and hosting the IPPS delegation. Also thank you to Paul Senhe of the Senhe Seed Company, the flower show and conference organizers, local nursery businesses and local government officials for their exceptional hospitality during our visit. During the China visit the European Region gained a new member. Luc Block, a nurseryman from Belgium who was attending the conference and flower show joined the IPPS group to tour the nurseries and cultural sites. He was so impressed with the group that he joined IPPS when he returned home. IPPS is truly an international group when you can gain a member for the European Region while attending a meeting in China. With the support of the Australian Region and the leadership of Clive Larkman and Peter Lewis, we are hopeful IPPS China will become a full region very soon.